patches denim cat light blue, iron-on patch, Flickli - solid denim patches perfect suitable as knee patches! A super patch cat in light blue! The pants patch is made of sturdy lightblue denim and thus ideally suited as a knee patches. 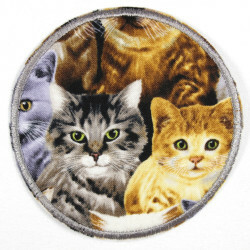 The used high quality ironing film attaching this cat Patch is easy. The cat Patches comes in a packaging with a detailed Ironing instructions. 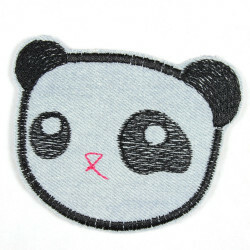 The one iron-on patches for all fans of the wildlife! 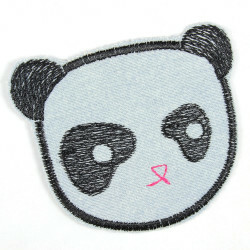 The iron-on patches cat is not only suitable as knee patches it´s also perfect as iron-on applique f.e. on a jeans jacket. You wanna be strong like a cat? Show it! With the cat iron-on patches! There are much more cat badges available in the shop offer by flickli.de! Feel free to combain with one more available blue cat badge from the offer of wertstueck flickli patches on flickli.de or use it as an really nice single animal applique! Are you looking for different cat badges? 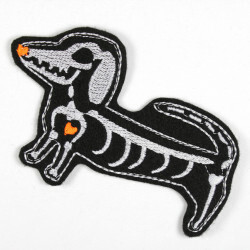 Feel free to look around in the shop flickli.de You can find much more pet iron-on patches in different forms and colors. The cat iron-on patches is washable at 40 ° C in the washing machine inside out. Please do not tumble dry. 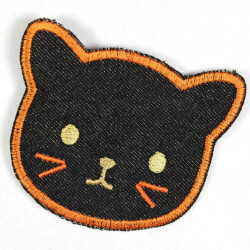 The offer is for one iron-on patches cat black (fig. 1) Figure 2 show beside the offered cat badge one more avaliable cat iron-on patch on flickli.de.